High speed doors are exactly what their name suggests. Moving at a high rate of speed, these doors ensure not only the smooth flow of traffic within the industrial setting, but also allow for perfect environment control. From larger industrial door options to machine protection doors, external and internal doors, as well as those specially designed for food processing. High performance doors guarantee the smooth flow of materials. This reduces energy costs and ensures a constant room temperature. Catering to a wide range of industrial needs, these make for perfect assurance that your business has the needed products to secure and protect your investments. 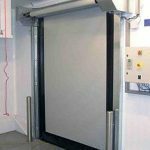 From clean rooms to food rooms, store rooms and warehouses, these high quality door systems allow you to rest easy knowing your environment is controlled and your business secure. As a reliable, professional brand in South Africa, we have a trusted range of products that can cater to your every door need within your business.